Despite a turn in the Atlanta weather, KISS fans turned out in droves for the 10th annual KISS EXPO ATLANTA. Since KISS were (and are) the reigning kings or merchandizing, there were TONS of dealers with videos, CD’s, posters, toys, you name it. Although I can’t spend money on KISS merchandise like I could as a kid in the ‘70s, it was a blast to see what the items in my collection go for these days! One of my old tour programs goes for $25 as does one of my solo album picture discs. One of the coolest parts of covering the KISS EXPO was just wandering around and talking to the fans. And of course taking pictures of all the Kiss look-alikes! They came in all ages and gender and I photographed as many as I could find. Plus I had some great fun with my advance copy of Hayseed Dixie’s KISS tribute album, “KISS My Grass”. I walked around the EXPO with a portable CD-player, playing Hayseed Dixie’s bluegrass treatment of KISS classics! I was overwhelmed by the response – at first I got some weird faces, “what is this guy playing bluegrass for? !” Then came the recognition of the KISS lyrics and before I knew it, everybody wanted a copy, some even offering to buy my review copy. For more information about the Hayseed Dixie "Kiss My Grass" CD visit Dualtone Records. To read our review of the Hayseed Dixie KISS tribute CD Click here. Mad Margritt (interviewed this issue) was at the EXPO, in a booth sponsored by their record label, Perris Records. Danny Bellli (Mad Margritt drummer) kept the passers-by entertained ALL day with his own “special” brand of humor! Early in the afternoon was a Bill Aucoin and Lydia “Beth” Criss question and answer. Having KISS’ former manager and Peter Criss’ former wife led to some interesting stories. I taped this Q&A and hope to run the transcript in an upcoming issue of EAR CANDY. Lydia, of course, was asked about the popular KISS song “Beth”, which she partially inspired. Also, Lydia mentioned her upcoming book, “Sealed With a KISS” that will be released sometime this year. 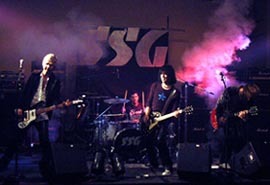 After the Q&A, I sat down with the members of the band SSG to conduct a little interview (also featured in this issue). 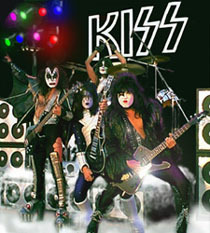 Next was the “KISS look-alike contest” performed on the stage. As the men KISS look-alikes were heading towards the stage, I heard one “Ace” exclaim, “its not fair, Gene always wins!” Since there were tons of “Gene’s” in the running, they created a separate category for “Gene” to make it a little more fair. The final event of the night got off to a late start and that was the show by KISS ARMY. And who better to introduce the hottest tribute band in the land but the first KISS manager, Bill Aucoin. Bill said some great things about the band, followed by a KISS sound montage of songs and interviews, while the band readied to take the stage. However, the band was plagued by sound problems at the Hyatt Ballroom and some problems with Ace’s guitar/amp. I left after only three songs (“Detroit Rock City”, “Duece” and “Let Me Go Rock ‘N Roll”) because I was exhausted after the days events and also knew that the band was having an “off” night. I later contacted the members of KISS ARMY for an interview (featured in this issue) and a promise to review their next show in Atlanta. All in all, the KISS EXPO was a great experience. The fans especially made it enjoyable. You could simply walk up to any KISS fan in makeup or holding merchandise and talk to them. This is in contrast to the Beatle conventions that I’ve been to in the past. While KISS fans are rabidly passionate and dedicated they are down to earth, with NO pretensions. Gene Simmons always brags about KISS fans, and I got to see why first hand.